If you’re building or renovating your home, the front entrance is a key consideration. An impressive front door not only adds street appeal to your home, it offers security against trespassers. Your home is your castle. You need to feel confident, knowing there are barriers in place to prevent an intruder. One comforting way to enhance home security is through the installation of wrought iron safety doors. Fortunately, wrought iron safety doors can also offer an attractive entry way alternative. Wrought iron has a timeless appeal, preventing entry thanks to its solid nature whilst also looking amazing! Here are some reasons why you might consider a wrought iron safety door, compared to other preventative security measures. A front entrance that looks like Fort Knox may repel intruders, but it doesn’t look very appealing for guests that come to visit. Wrought iron safety doors can offer a unique, yet welcoming entrance to your home while offering an unyielding entrance that is difficult to break through. Doors and windows are the most logical points of entry into a home, so it’s important these entrances are secure. Many property owners consider screens or security mesh to prevent an intrusion, but often these can compromise the outside aesthetic of the home. Unlike other door materials like timber, wrought iron can withstand severe weather and day-to-day abrasion from outside. Because wrought iron is a mix of steel and iron, it is the most durable door material a home owner can buy. No matter how extreme the storm, like hail, wind or rain, wrought iron won’t buckle or deteriorate like a timber door would. What’s more, wrought iron safety doors are very easy to maintain and won’t need to be resealed or treated to stay structurally sound. Forget the endless repainting or staining that comes with wood, or the rust proofing and repairs required for flimsy security screens. Wrought iron safety doors can allow property owners to take advantage of beautiful weather and invite air flow through the home, without compromising on safety. No matter how intricate your choice of wrought iron design, the style will include spaces that ensure you never feel like a prisoner in your own home. This has real benefits for the look and temperature of your home, but also for your health! If air flow is a real benefit for you and the temperature of your home, consider a less detailed design to ensure a maximum air stream through your home. Wrought iron is a heavy-duty material and will protect your entrance from unwanted intruders. It’s a security option that is difficult to tamper with and break into. This impenetrable style of door can be a great way to ward off potential criminals in areas where burglaries are a common occurrence. Wrought iron instantly screams ‘too difficult’ for opportunistic intruders! A great advantage of installing a wrought iron safety door is that it can be custom made to suit the style specifications of your home. The front aesthetic of your home doesn’t have to be compromised by the design of the door. Wrought iron contrasts well with most building materials including brick, veneer and timber. Wrought iron can complement contemporary and traditional properties. Wrought iron safety doors aren’t just a great option for homes, they can be a great option for commercial properties and public buildings, too. They create an elegant and sophisticated entrance, and their ornate designs can be custom made to suit the aesthetic of the commercial building – and complement your brand. Wrought iron safety doors can be designed with any style in mind. Some of the more popular looks include decorative spirals, spears, leaf and vine designs, as well as patterns that have a gothic or baroque aspect. One advantage of using wrought iron is its malleability into decorative, robust and spectacular designs. Not many security products offer such an eclectic range of design possibilities. Having said that, a simple vertical bar design can also be striking, working well for modern buildings, which make the most of clean lines. Wrought iron can be used as a security measure for windows and fences as well. With this in mind, the design for the doors and windows can complement each other. A wrought iron fence, door and windows combination offers three lines of defence to your property, making it a valuable security measure. It would be wrong to assume wrought iron should be used for the front door only. Intruders will rarely enter via a front door if they want to illegally access a property. Most intruders will look for a less conspicuous way to enter a property – which is often the back door. Why not consider a simple wrought iron safety door for the back entrance to ensure all access points to the home are covered for safety? Save your design flair for an ornate front door, and stick with clean lines for a functional back entrance. On the other hand, some people spend a lot of time entertaining in their backyard, so you might consider making the back door just as fancy as the front! Wrought iron safety doors can be installed at the front door, at the front entrance of a home, or as a back door, side entrance, or on a veranda. 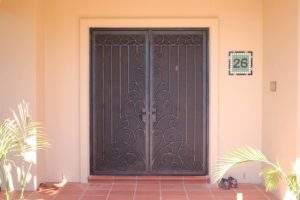 If you are considering a wrought iron safety door for your property in South East Queensland, the team at Dean Wilson Iron would love to help you. Their expertise in wrought iron manufacturing will ensure the door design you choose will offer maximum impact while complimenting the street appeal of your property. Looking for design advice or guidance on wrought iron safety doors? Give the team at Dean Wilson Iron a call today to organise a quote.